Discover how air tubs work, the different air systems offered & learn which air features and options will be best for your air bathtub. An air tub creates thousands of warm bubbles that caresses the skin. The bubbles stimulate the skin's light touch receptors, producing an overall calming effect. 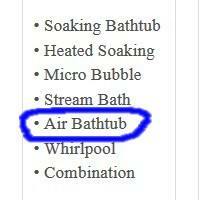 What is an Air Tub? A blower (motor for an air bathtub) works like a giant hair dryer. 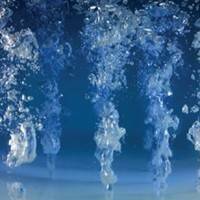 It warms the room temperature air by approximately 30° and blows it into the bathtub. Its kind of like when you were a kid and blew through a straw into your soda, producing lots of large and small bubbles. Air tubs differ from a whirlpool in that the massage is much softer. Take your hands, open faced and rub them together. This is the massage intensity of an air tub. The intensity can be changed with the control. Turn it down for a "low simmer" or all the way up for a "full boil". Many also have a wave and pulse feature – amount of air is preset to change according to a pattern. There is more noise with this type of system. It is not the sound of the pump that you here but a "bubbling & popping sound" that the bubbles make. An Air Tub differs from a Whirlpool in many ways. See Spa Tubs → for more information. Does An Air Jetted Tub Feel Cold? Often it is said that air tubs can feel cold, or cool down quickly. The air blown through the tub is warm, but it can feel cool on the skin. Let's say you are working outside and you are hot and a bit sweaty. A breeze blows by and even though the breeze is the same temperature as the surrounding air, it gives you the chills. Air on hot, wet skin can cause chilly sensation. Some people are more prone to this than others. If this sensation affects you, an air tub can still be for you - look for a perimeter air system (see air jet location below). Not all tub companies put there air jets in the same location. Some are perimeter systems (just above the tub floor, around the sides of the bathtub), some are across the bottom and some include jets on the back. Some offer a option of perimeter or bottom, some have all. With a perimeter system the air blows horizontally in to the bath. It pushes the water at the bather, the air not hitting the skin directly. When the system is on the bottom, air comes up directly under the bather, bubbles hitting the skin, giving a more vigorous massage. The technical sheet for the bath will give more information on air location. There are two air systems - air injector and air channel. With an air injector each air port is individually plumbed with a back flow prevention. Air can come into the bath but water can not flow into the piping system, In the case of a channel system there is a channel built around the bath. Air flows into the channel then into the tub through the air jets. Air and water can enter the channel. Both systems have a purge cycle. About 20 minutes after the tub is turned off, the system restarts blowing air into the the tub to remove any water in the system or surrounding the injectors. The blower is usually located behind the tub's back slant. Access can be through a front skirt, behind the back rest or the back wall (the last two especially if a closet is located there). The technical sheet for each tub will show the location, if the blower fits underneath the tub and if there are optional locations. This is an important consideration for all system tubs (motor or blower). Murphy's Law suggests build access and it won't be needed, don't - and the results may be very scary! 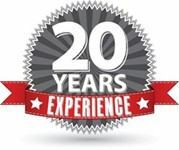 Recommendations for access size vary among manufacturers: Jacuzzi® 12" x 18", Hydro Systems 14" x 16", Aquatic 16" x 16" Down load the instructions from the manufacturers web site to see what size you will need. It is not recommended to remote the blower unless it is needed to gain access. In the lines we carry it is difficult to hear the motor over the sound of water movement - so there is no need to remote the blower to keep noise levels down. On some freestanding baths and combination tubs the blower will need to be mounted remotely. It is best to keep a remote blower as close to the bath as possible. The further away the blower is, the less air pressure and the cooler the air. There are two things that connect from the blower to the tub: Air Hose & Control Cord. All our bathtubs come directly to you from the factory. Tubs are created at time of order - customized just for you - no refurbished or second tubs. Fully warranted by the manufacturer. Often you will see list prices given. That is not the sale price. You just get a hold of us and we will give you the best deal. We have sorted all of our tubs by size to help you with shopping. You will find these links below. Before you head there, we do offer more information on finding the perfect bath tub. Our article Choosing a Bathroom Tub → gives thoughts on the different things to consider like installation styles and tub sizes. When shopping through our tubs by size or style, you will see a list of the tub systems offered below the tub size and installation style. Look for Air Bathtub to find this system. We are very proud of the companies we carry. They create air bathtubs from the highest quality of acrylic, heavy duty fiberglass backing, excellent motors and powerful jets. Why do we carry so many brands? Each company provides a different mix of sizes, jet locations and air systems. Providing multiple choices allows you to find the perfect bath for your needs. How do you choose from so many? The simplest way is to give us a call - 866-380-0303. Tubz.com is here to help you sort through all the tubs to pick the best air tub to fit your needs and budget.